The Atlantic blue crab is a member of the Portunidae swimming crab family. Its Latin name, Callinectes sapidus, translates to "savory, beautiful swimmer". Blue crabs are named for the bright blue coloring on their legs and the blue tinges to their mostly brown shells. While the legs of males are solely blue, the legs of females have orange tips. 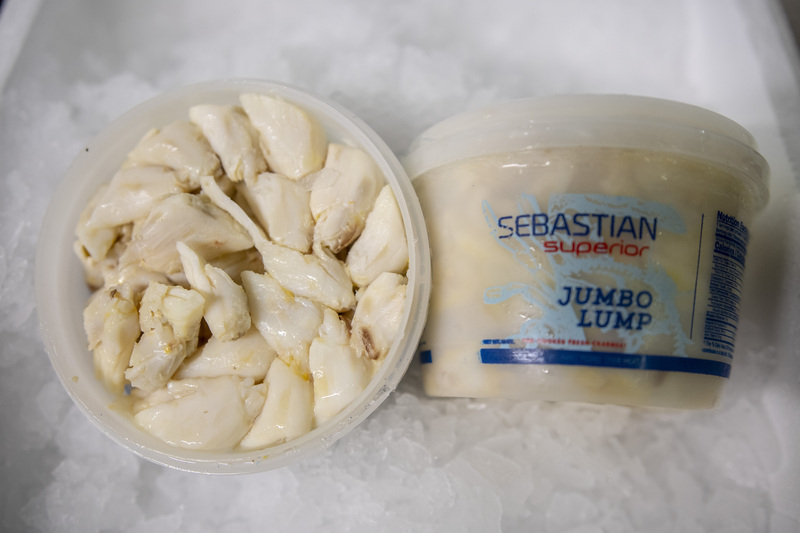 Blue crab meat is white, tender and flaky with a rich, sweet and buttery flavor. The claw meat is a bit nutty and has a natural brown tint. Lake Maracaibo, a large brackish lake in Northern Venezuela, and the estuary connecting it to the Gulf of Venezuela supports the largest crab and crabmeat industry in Venezuela, most of which is exported to the U.S. The crab populations have been heavily fished and were not managed until the early 2000s. The population is depleted and may still be undergoing overfishing. In 2003 a new government body was assigned the task of managing Venezuelan fisheries and now there are regulations in place for the crab fisheries, including a closed season during August and September, closed areas in the lake, a minimum size limit of 8 cm, and a prohibition on retention of egg bearing females. Crabs are harvested by longlines. This gear generally has little impact to the surrounding ecosystem, assuming the lake floor is primarily muddy or sandy, but can have very high levels of bycatch and does not discriminate by size.Crab harvesting is accomplished by artisanal village -based fishermen, many of whom live in stilt house communities. Small wood boats of approximately 16-18 feet, powered by outboard engine serve as fishing vessels. Square wire mesh Chesapeake Bay-style crab pots are the primary harvesting gear, although some catch may come from small net fishermen. Each crab pot fisherman only works 40-60 pots and harvests only 50 to 100 pounds of live crabs per day. This was cited as a major problem by at least two processing plants. On~ plant operator went so far as to say that the fishermen were only interested in harvesting enough crabs to supply their daily food and drink. The harvesting sector is heavily subsidized by the processors.Processors provide puts; one processor reportedly has between six and seven thousand pots being fished for him, all of which he provided. In some cases, boats, engines and bait are also provided to the fishermen. Initially the agreement was that the harvesters would repay the processor for the gear. However, over the years repayment has been disregarded, creating a large capital investment on behalf of the processor. Justification was given that this was necessary to keep the fuhennen in "corporate dedication" nut only to the processor but to the industry itself.